You may have time to juggle two clients at the same time or have multiple appointments overlap. Shedul's flexibility allows you to run as many appointments simultaneously as you need. 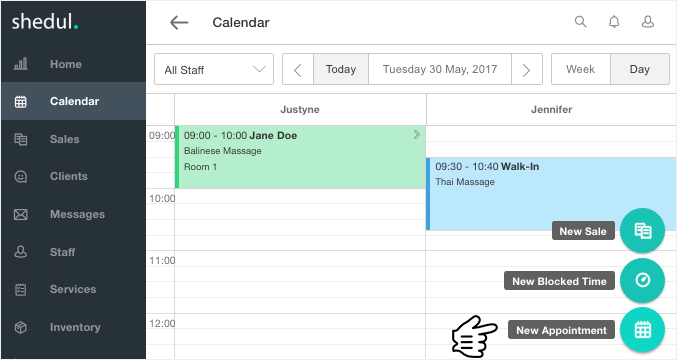 To double book an appointment, click on the Green Button in the bottom right-hand corner to create a New Booking, where you can set the start times of your appointments to overlap. TIP: You may not need to double book as we have an official feature for Processing Time. The Processing Time feature allows you to indicate how much development time a service requires eg hair bleaching or a facial mask, which leaves you free to service another client while your first client's treatment is still processing. See Add Processing Time for more info. Important Note: Clients cannot and will never be able to double book appointments whilst booking online. Only staff with login access can double book appointments should they choose too.